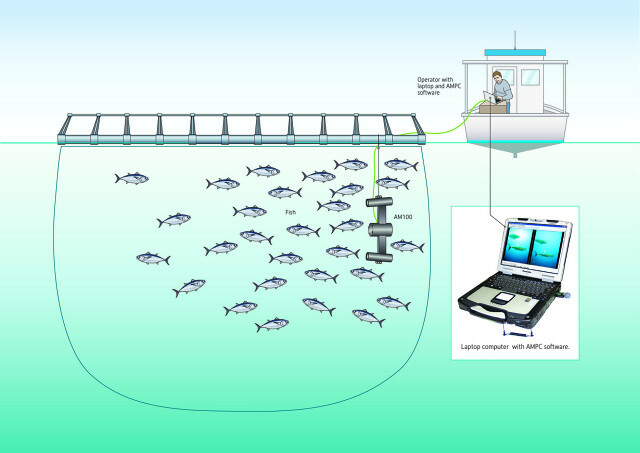 To meet the needs of farmers for non-invasive sizing and counting of fish in cages, AQ1 developed the AM100 system. The system uses Gig-E-bit ethernet stereo cameras and advanced software for image processing to take rapid and accurate measurements. Sizing can be done by single or multiple point-to-point measurements that can be analysed directly or used to automatically generate weights or size distributions. The AM100 analysis software can count objects moving past a fixed point, which is great for fish transfers. The AM100 is leading the way in measuring those larger and fast swimming species such as tuna and kingfish but is equally accurate with salmon, barramundi and other finfish.